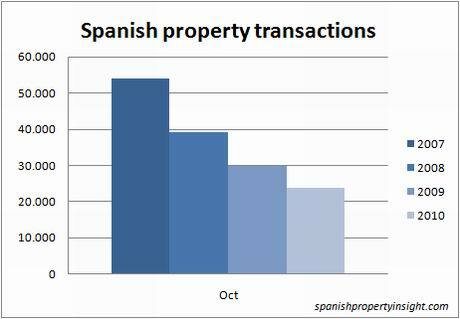 The Spanish property market had a dismal October, with home sales down to the lowest level in a decade (I can’t say exactly how long as this data set only goes back to 2007, but it is likey to be at least a decade). Excluding social housing, there were just 23,927 home sales in October, down 25pc on September and 20pc on the same month last year, according to the latest figures from the INE. As illustrated by the chart above, it looks like the market has lost all power after staging a weak recovery over the summer. October represents a dramatic lurch back down. The following chart looks at October alone. The inexorable decline in sales couldn’t be clearer. 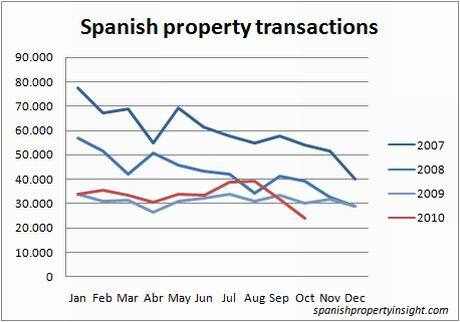 Most articles in the Spanish press explain the fall as due to the imminent loss of mortgage tax relief taking effect at year end. They may or may not be right. It might also be because would-be buyers can’t get mortgages and can’t afford today’s prices. 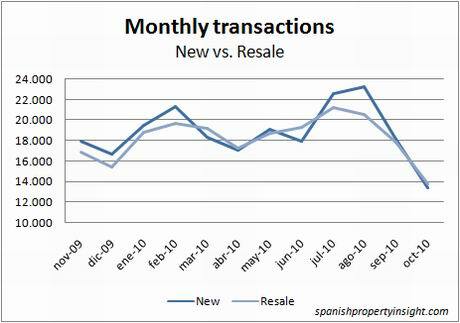 Both new and resale transactions had a bad month; new sales in particular, dropping 20pc on last year. Even so, the market is still up by 7pc over 2009 on a year-to-date basis, so there is still a chance that the year will close with an annualised increase in transactions. But that will be little comfort given how bad last year was. The following table shows YTD sales and rates of change over the last 4 years. And finally, a table showing changes in selected regional markets in the year to date. 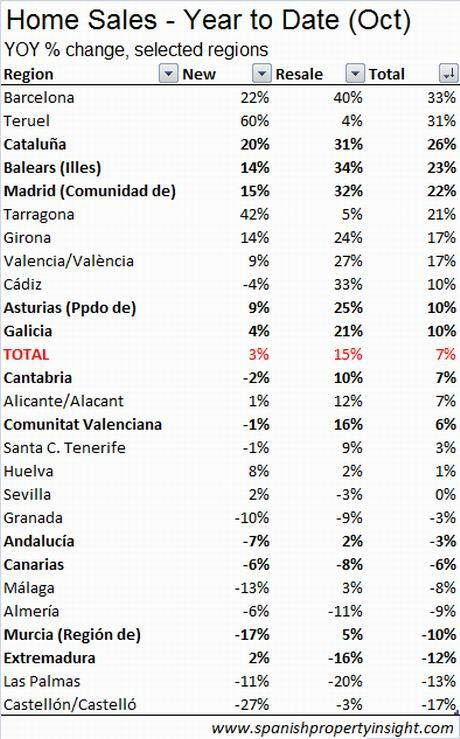 Barcelona is doing best, up 33pc on the same period last year, and Castellon, home to the Costa Azahar, is doing worst, down 17pc. Popular holiday-home destinations like Malaga (Costa del Sol), Almeria, and Murcia are all down on last year. When we say “home sales in October” – how does INE measure this? Is this the number of completions signed at the Notary in October? I can’t see where else they could get official data from (as agents are hardly going to call up and report sales). If this is so, and the average house sale takes two to three months to complete, could it be saying that sales were very low in say July / August hence low completions in October? Just interested how they get those figures… Any intelligence much appreciated!